Vinyl Resin for Coatings help improve the sustainability profile of dispersions from the production process through the final paint sale to consumers. Vinyl Resin for Coatings are ideal for the production of colorants for low-VOC paints. To provide a pigment resin dispersant which in case of the pigment dispersed as a pigment dispersant, its dispersion stability becomes good by showing affinity to water, and which can obtain a good pigment dispersion liquid due to adsorbing to the pigment by having pigment affinity, and to provide a Vinyl resin, a water dispersion or an emulsion which can be used as a good binder component. 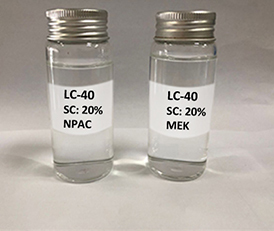 SOLUTION Vinyl Chloride Copolymer Resin: In a graft copolymer comprising copolymerizing a macromonomer (A) and a monomer (B), the macromonomer (A) is a polymer comprising an ester monomer (a) of an addition polymerizable unsaturated carboxylic acid and an aliphatic alcohol, and an addition polymerizable monomer (b) having an acid group, the polymer having an addition polymerizable group at the terminal, and an acid value of 100-300, and the monomer (B) is the addition polymerizable monomer, the macromonomer (A) unit occupying 20-50 mass% of the total graft copolymer, and the monomer (B) unit occupying 50-80 mass% thereof. Vinyl Resin for Aluminum Foil Ink: Good adhesion to aluminum foil and dispersibility to pigments. Carboxyl vinyl resin is mainly used. Vinyl Resin for PVC Ink: Good adhesion to PVC and dispersibility to pigments. Vinyl Resin for Heat Transfer Ink: Good adhesion to PVC and dispersibility to pigments, heat transfer printing temperature can be reduced. Vinyl Resin for Car Refinishes: Providing adhesion on the substraces, with good dispersibility and directional alignment functions for both pigments and silver powder. Vinyl Resin for UV Coatings: soluble in monomer、solvent-free residue, provide the adhesion on substrate, such as ABS、 PET and PC etc. It could provide the alcohol resistance and dispersibility in pigment. Vinyl Resin for Paper Ink: Providing adhesion to the paper,with excellent dispersibility to the pigments.